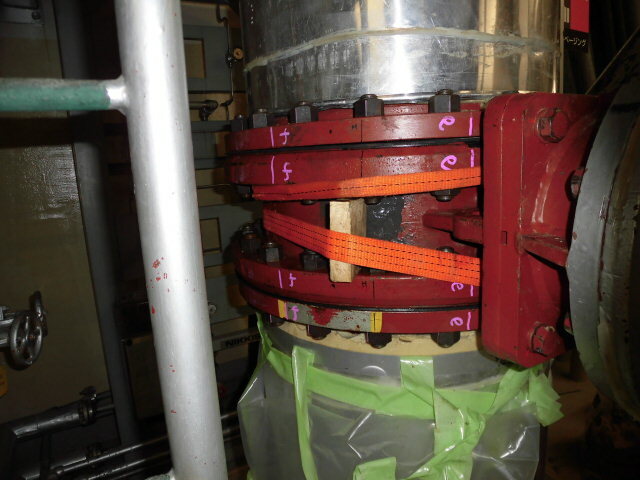 Last week another inspection was conducted inside unit 2 at Fukushima Daiichi. This new work looked inside the reactor pedestal area. The space is below the reactor vessel yet within the containment vessel. 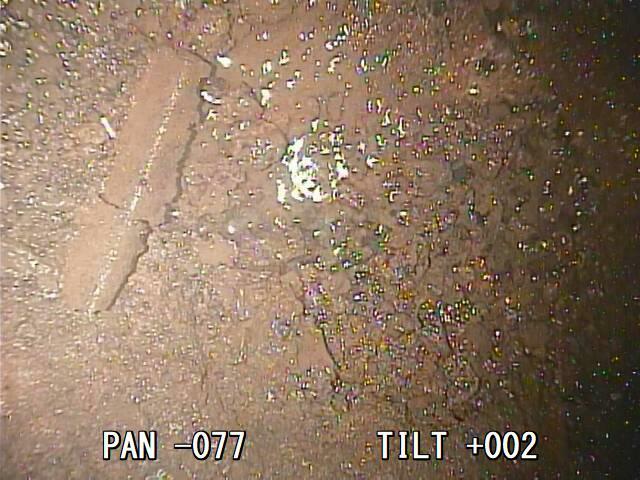 This is the third time in the last year’s time that TEPCO has conducted major investigative work inside the damaged reactors and has purposely hidden information from the public. The condition of the damaged reactors, the location and condition of ALL of the fuel debris is owed to the public. The TEPCO exacerbated disaster has impacted the regional population, the environment both locally and globally and poses a long term risk to Japan and the wider world. This information is also withheld from wider academic research, hindering the full understanding of the disaster. TEPCO is morally obligated to be transparent and up front about the all of the findings at the damaged nuclear plant. 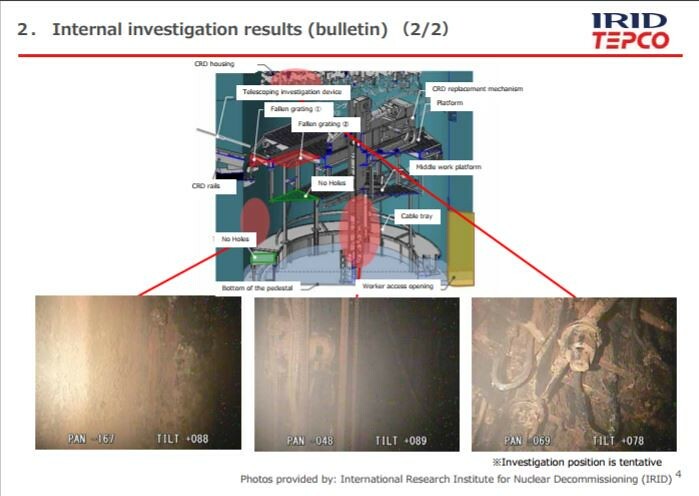 In this most recent incident, the scope inspection inside unit 2’s pedestal resulted in 5 photos of this area that were made public. One looked at the pedestal wall, one looked across at the control rod handling machine and two looked at an elevated rail along the pedestal wall. None of these photos are views of the pedestal floor or where the bulk of the fuel debris would be located. These images also do nothing to quantify the fuel, its location or condition. The equipment used had the capability to do all of these things. We explain in further detail below. TEPCO has previously claimed they would later release withheld data after analyzing it. In the case of the previous unit 2 inspection and the recent unit 3 inspection that did not happen. Any subsequent reports included limited bits of data used by TEPCO to heavily control information. These only disclose a tiny sliver of data, what they wished to tell the public. The full videos, imagery, temperature and radiation data collected during these 3 recent inspections is hidden from the public. This was not always the case. Early inspections done on site included much more transparent disclosure of data even if they were not complete. 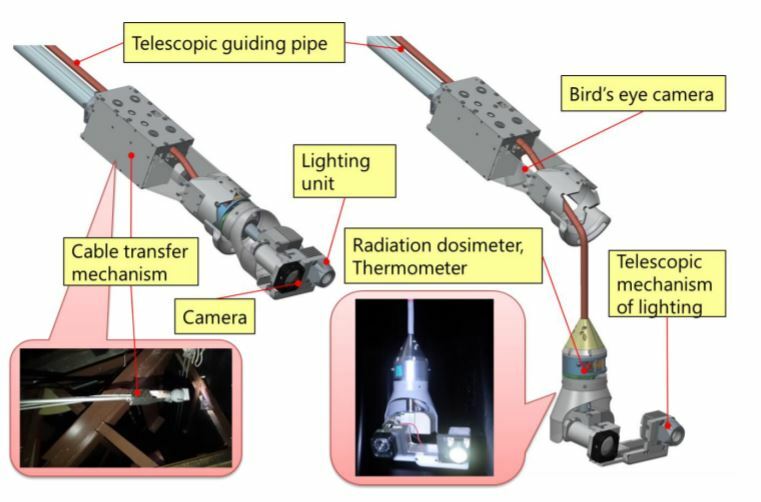 TEPCO has used media mistakes as an excuse to hide critical data from the public. During the containment inspection of unit 2 conducted with a pair of robots, a major newspaper misquoted a radiation reading. A high reading inside containment was misstated as being “at the plant”. This caused some brief panic as people thought environmental radiation at the plant rose. These kinds of press mistakes are not sufficient grounds to hide data from the public. TEPCO must disclose data. In turn the press must assure their journalists understand the technology in order to produce accurate reporting. Security and nuclear secrets have been used in the past as an excuse to not provide certain information. The heavily damaged post meltdown reactor containments and similar structures do not meet any such need. Most of the critical systems are severely damaged. TEPCO will never operate another BWR Mark 1 reactor. Those would be units 1-5 at Fukushima Daiichi. None of these will ever operate again. Any claims of proprietary secrets were lost as units 1-4 spiraled into a global catastrophe. TEPCO must fully disclose all of the data for these and other critical inspections at the reactors. If TEPCO requires time to grasp the information before releasing it to the public they must state a date that the remaining information will be disclosed. Then they must follow through and release ALL of the data from the inspections to the public. With the most recent inspection the photos below are all that is given to the public. None look at the pedestal floor and none look towards the central area of the pedestal. The central area of the pedestal floor is the most critical location for understanding the location and damage caused by the melted fuel. One photo taken looking inward of the control rod handler is taken at an upward angle and provides little relevancy. Note the vertical tilt readings on each of these photographs. This handout from IRID documents the capability of the scope and drop down camera. The camera has a 120 degree vertical tilt and a 360 degree horizontal pan. Each of the photos below shows a significant upward tilt angle. Even if the camera’s lower limit was 0 the camera in these images could have looked further downward. This includes the lone photo pointed inward into the pedestal center. 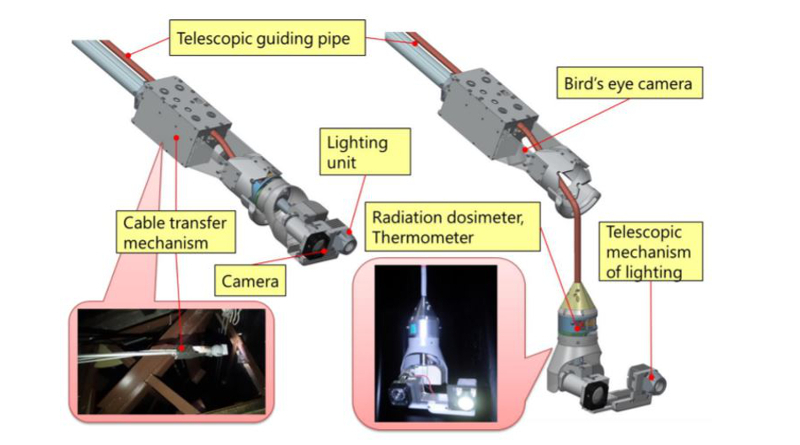 This slide from IRID shows that the camera can look straight downward once the probe is deployed on its cable. Image looking at lower metal rail near pedestal wall, taken with a slight upward tilt. this rail is roughly 1 foot off the pedestal floor. Image taken of debris on the metal rail near the pedestal wall. This is roughly one foot off the pedestal floor with an upward tilt of +071. From this position downward images and viewing the central portion of the pedestal floor was possible. Image looking towards the central portion of the pedestal with an upward tilt of +089. A downward view from this position would have shown the area of the most interest in the pedestal. 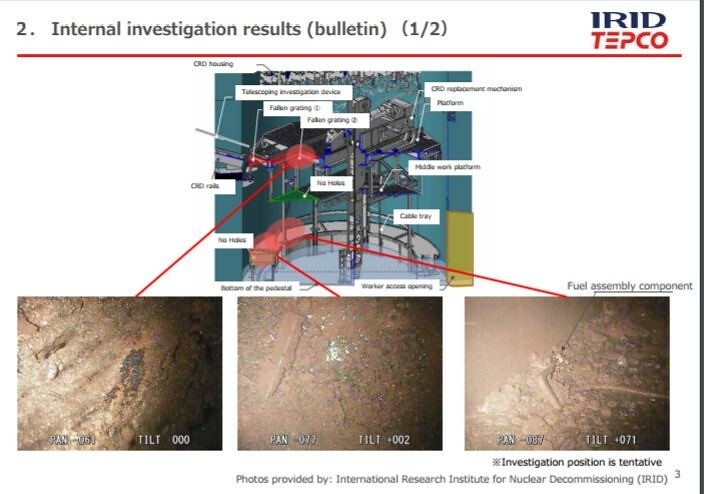 These two slides from the TEPCO handout show the locations of these photos. Both the wall and control rod handler were captured using an upward tilt angle. Taking downward photos was possible here. The two images for the lower pedestal shown in the slide below were taken using an upward tilt angle. This places the probe at or below the metal rail. This is an idea position for images of the pedestal floor. 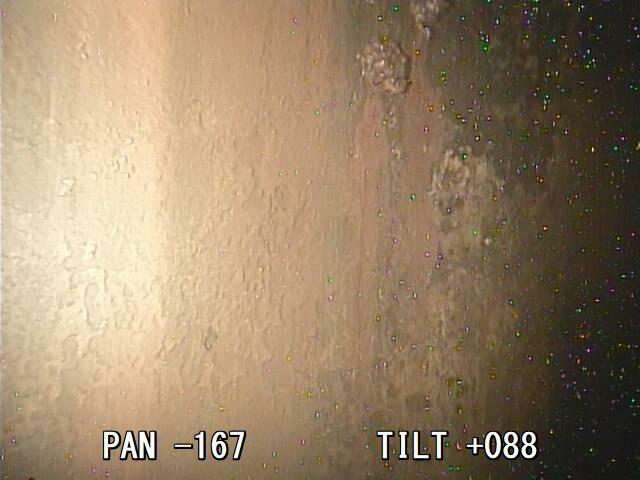 It is assured that TEPCO has significantly more imagery including imagery of the pedestal floor. TEPCO is still on taxpayer funded financial life support. The cost of this inspection and the radiation exposure of the workers who did this work are both considerable. 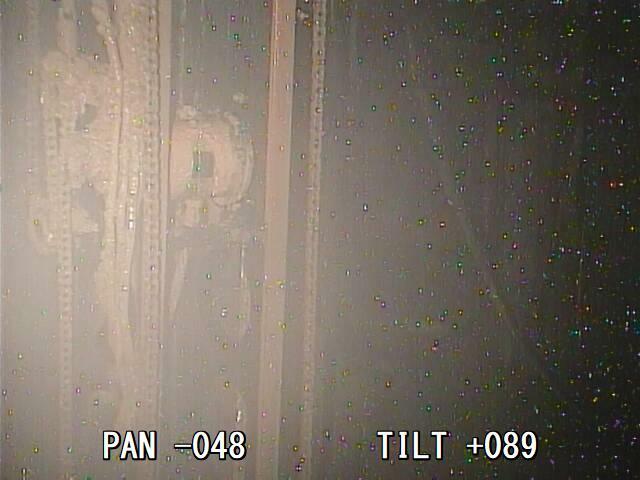 If TEPCO were to claim they did not bother to capture imagery of the pedestal floor or across the lower pedestal room, this would bring up a negligent waste of taxpayer money. 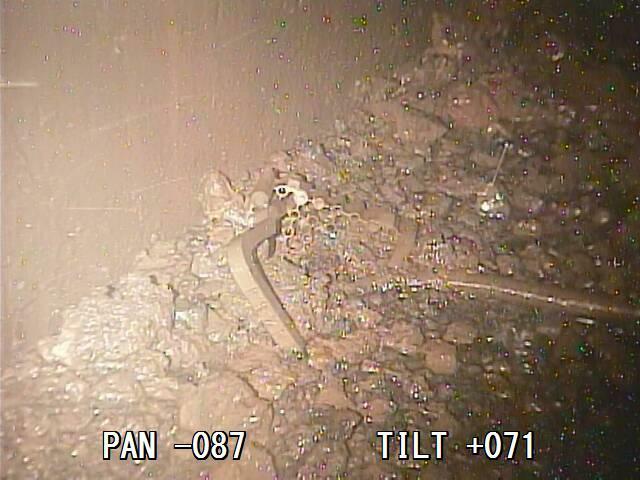 TEPCO must fully disclose all of the data collected during this inspection in a timely manner. They need to do so for the other recent containment inspections immediately. Anything less is a cover-up.